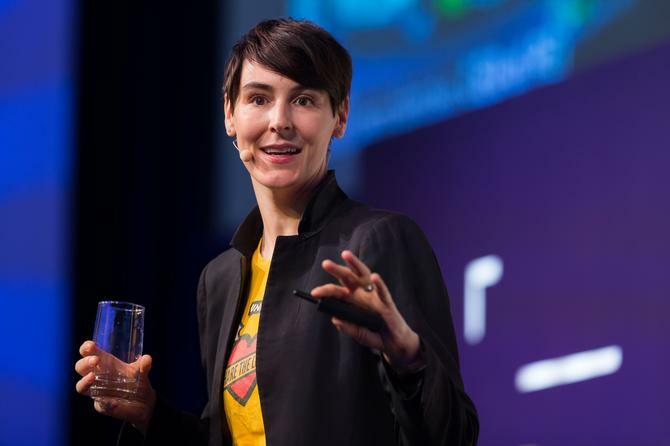 Marketers looking for cut-through need to be courageous, take risks, hold firm to their purpose, shake-up organisational structures, and be willing to allow their teams to be silly from time to time, Unruly’s co-founder and CEO, Sarah Wood, claims. Speaking at this year’s AANA Reset conference in Sydney, Wood said building a culture that isn’t afraid to try new things is vital in earning the attention and trust of modern customers. Unruly is a programmatic video ad tech startup acquired by News Corporation 12 months ago. For Wood, one big lesson marketers can take away from startups, and one of the foundation ingredients to fostering courage, is a distinct brand purpose that people can buy into. “This is something entrepreneurs are very passionate about, and it’s what will help you hire the best talent,” she told attendees. “That is super important. “We are a people business. We might be in tech, but our secret weapon is our passionate people, who are on a mission to deliver the brand. That vision to transform digital advertising for the better has kept us going. People assume entrepreneurs are born bold and brave and are huge risk takers by nature, but that’s not always the case, Wood claimed. “Entrepreneurs are not born, you learn courage through your purpose and knowing what you want to achieve and having an incredible team that works with you to do that,” she said. Wood called on marketers to exhibit more “random acts of courage”. “If anyone wants to do something different, and change things up a bit, then I recommend a random act of courage, and just doing something you wouldn’t normally do. It’s an effective way of trying something different,” she said. At the same time, Wood recognised that in the corporate world, jobs can feel insecure, reducing the risk appetite and willingness to change. The ever-shortening tenure of CMOs also raises a big question: How can CMOs plan for the long term and be courageous if they’re only going to be in the role for a couple of years? One suggestion Wood offered up was partnering with your human resources department. “HR will be your instigators of change in many organisations, so whoever your chief people officer is, you really need to know them if you want to change things up,” she said. “It may be structural change that’s required, a de-siloing and a change of structure between the centre and outside, or top and bottom. Getting to know the HR team can be a very practical way of emboldening an organisation. What entrepreneurs are not afraid of is doing things differently. As a way of tapping this thinking as marketers, Wood flagged collaboration and peer-to-peer learning as helpful steps externally. Internally, it’s about building the agility to fail fast and learn fast, and creating minimal viable products and processes that allow you to foster innovation. When asked how CMOs can improve their ability to “try something silly”, Wood said it’s the people around you that need to be given a licence to give new things a go. “Some are these things will come off, some won’t come off and we don’t hear about them. Make sure the team around you feel they are allowed to fail, be silly and daft,” she added.